We want to thank Spring Devlin-Moore and McDonald's for hosting our April Committee Meeting and Meet and Greet last night. Finishing touches were put on the plans for the Wild Water Derby and reviewed some upcoming events. 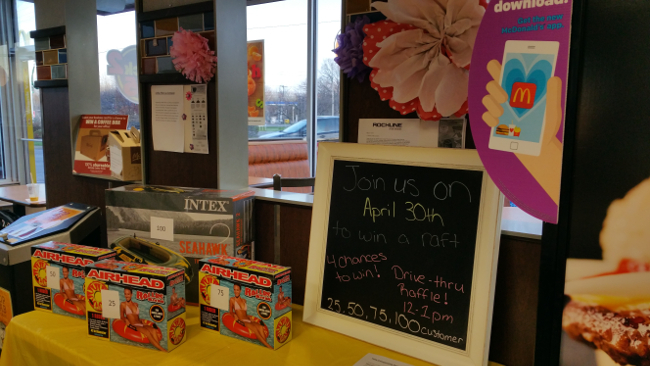 We also learned McDonald's is holding a drawing on Saturday for four different water prizes. From 12PM to 1PM, the 25th, 50th, 75th and 100th customers at the drive-thru will win a prize. The 100th gets the Intex Seahawk Inflatable boat.